This project is a learning experience designed to improve student engagement in history learning through a mobile augmented reality gymkhana. The experience was part of a formal higher educational environment, where some students could acquire 1 ECTS (European Credit Transfer and Accumulation System) of a national University in Spain. The project was part of a formal course of a University for those History students interested on 1 ECTS. The project also was open to the general public and had other participants not interested on credits, so they participated just for learning and have fun. ●	it is integrated in a game that uses mobile devices, fostering interactivity and engagement of the students with the narrative story of the experience. ●	it allows the easy introduction of multimedia information for documenting the game story. ●	it allows to associate dynamically buildings, people and events in the Madrid of 1651, relating them with the current structure and urbanism of today Madrid. ●	it obliges to students to mix different roles: they must be actors, by walking Madrid and resolving questions related with old Madrid, and directors, by building a complete picture of the proposed story. ○	Student becomes proactive and looks for the contents instead of just receiving them. Thus, the student is receptive to obtain information, which improves content assimilation and knowledge retention [Novak & Gowin, 1984]. ○	The student must find the answer of a riddle to get information about how to continue in the gymkhana. Thus, the student feels curious about what is next in the game. Curiosity plays a fundamental role in concept assimilation (Alessi & Trollip, 2001; Gee, 2003; Rieber, Smith, & Noah,1998; Van Eck, 2006). ○	The experience is designed as a role game. The contents are designed speaking in third person of the singular. Thus, they include the student in the History, e.g., “You live in a ‘corrala’ in Lavapiés, which is the easiest and cheapest way to find a place to live in Madrid”, “Remember the balcony where you used to be with the other members of the war council. You have belong to it for years, like your father”. This kind of language make students get more involved in the story of their character. ○	Mobile augmented reality is visually very attractive, which may encrease student’s attention (Platonov et al., 2006). ○	The student is learning concepts in the spots where the History took place, not in a classroom.This may also influence the student engagement and content assimilation improvement (Akkerman et al, 2009). The experience was divided in three main modules. The first one corresponded to the study of serveral technological and historical contents in an e-learning platform during the week before the gymkhana. The contents learned during this week helped students to understand how to use the technology during the gymkhana (i.e., augmented reality and social networks) and provided a basic historical framework to participate in the experience. The second module corresponded to the mobile augmented reality gymkhana. In this stage, during only one day, students walked around Madrid discovering content in a role-based game. Each student had to chose a character in the history of Madrid in 1651. They could choose to become a noble, a ville chronicler or a commoner. Depending on the character that each student chose, they had to discover Madrid doing the same things that his character used to do. For example, a noble first in the morning take a walk in a carriage and then go to a palace, while the commoner goes to a fountain to take water and then look for job. Students played this role game seeing the things that their characters saw and walking around the city as their characters did. This parallelism helps the students get more involved and engage in the experience, because they are feeling it in first person. The organization provided the first clue of the gymkhana to the students in the starting point depending on their character. Using a map, they should go the first point of the gymkhana and look for some augmented reality content. Once they find the content in the augmented reality platform they could listen an audio explaining the things that their character did in that place. Then, they read some content and had to find the answer to a riddle. Once they find the answer the system tells them the next point of the gymkhana. The experience was complemented with dressed up actors between the gymkhana points. Each one of these actors performed a small representation, depending on the character chosen by the students, explaining more details about each point and character . This representation helped the students to get even more involved in the role game and enjoy the experience. Finally, in the third module, students had to create a blog about their experiences in the gymkhana. This activity lasted one week after the gymkhana. In this activity students had to digest the knowledge acquired during the experience and show how they have assimilate what they have learnt. 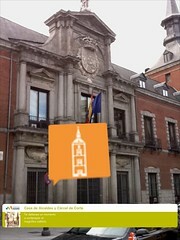 Regarding content, the History teachers located 15 important places, from a historical perspective in Madrid. A role game-like history script was created to show what happened in each of those places of the city for each one of the defined roles. Once, the points were defined, some text, images and audio explanations were associated in augmented reality to those points. Also, each point linked to a more detailed explanation of the place and a questionnaire. The participants had to solve the quizz to know the next point to discover on the city. The third stage corresponded to the development of the technology that supported the experience, including the mobile augmented reality platform and the e-learning environment. Both environments are described below. The e-learning platform used to give support to the pre and post-gymkhana included the integration of the contents in a SCORM course, so that teachers could track students performance. Some of the contents were offered via interactive video-lectures to help students get an overview of what they must learn from History and ICT to participate in the gymkhana. The environment also included communication tools, such as forums and chats, and a section to allow each student to publish their blog about the experience. Regarding the mobile augmented reality platform, the first requirement of the project was that the content should be located around the city. Although currently there are many augmented reality frameworks and platforms, many of them are not location-based but code-based, e.g., ARMedia (http://www.inglobetechnologies.com/), LinceoVR (http://linceovr.seac02.it/), JSARToolkit (http://fhtr.org/JSARToolKit/). The second requirement was to be available for as much users as possible. In this regard, many of the location-based frameworks are not designed for all operating systems, e.g., LibreGeoSocial (http://www.libregeosocial.org/) is only for Android, and JunaIO (http://www.junaio.com/) is for Android and iPhone. However, Layar (http://www.layar.com) and Wikitude (http://www.wikitude.com) are both available for Android, iPhone, and some Symbian and Blackberry devices. Finally, Layar was chosen as platform because many devices have Layar pre-installed and is more widely used in Spain than Wikitude. Layar-based developments require the creation of a content-management system that serves the POI contents to the Layar client. Thus, authors have developed a context-aware server-side platform that serves contents depending on the student profile and location. •	An image in augmented reality allusive to the place where the student is. •	A pop-up window at the bottom of the screen showing an image of the places and a short description of the feelings of the character in this place. This pop-up appears when the student touch the augmented reality image. •	An audio describing the actions of the character and the history of the place. •	A “more info” button that opens a window with extended information complemented with images about the place. Once the student has read and listen all the content, he/she must find the clue for a riddle given at the end of this window. It is mandatory to find the answer to the question to know the next point in the gymkhana. •	Creation of a mobile-adapted Web page incorporating the text and images provided by the teachers for each point of the gymkhana. •	Location of the places, (i.e., latitude and longitude, where information will be provided in augmented reality. •	Creation of the augmented reality pop-up and their associated content. •	Link each location, pop-up and mobile-adapted Web pages.